Video: Yosemite glaciers: Visit Lyell and Maclure Glaciers, located at the highest points in Yosemite National Park. These glaciers are still active but slowly retreating as climate change warms their environment. They are expected to last a few more decades until they melt away completely. Video supplied by the Yosemite Conservancy and Yosemite National Park. Glaciers played a major role in determining the landscape and features of Yosemite National Park. During the Great Ice Age, portions of the Park were covered by glacial advances at least three times. These glaciers, along with stream erosion and mechanical weathering, deepened Yosemite Valley, widened it, and produced the extremely steep valley walls. During the time of maximum glacial advance, a large trunk glacier filled Yosemite Valley. Smaller tributary glaciers flowed down adjacent valleys and merged into the trunk. When the glaciers retreated, the trunk glacier had cut a much deeper valley than the tributary glaciers, forming hanging valleys where the tributary glaciers joined the trunk. Today waterfalls such as Yosemite Falls and Bridalveil Fall mark the mouths of these hanging valleys. 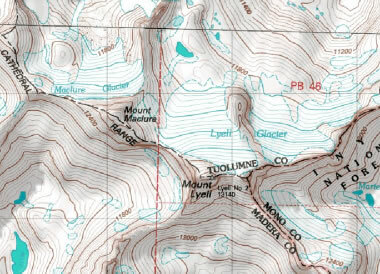 Yosemite glacier map: Topographic map of the area surrounding Lyell and Maclure Glaciers in Yosemite National Park. Map provided by MyTopo.com. Larger Printable Map. The glacial retreat also left a terminal moraine that created a dam across Yosemite Valley. A large lake known as Lake Yosemite formed behind that dam. Meltwater washed millions of tons of rock, sand and mud into the lake, filling it in some places with over 1000 feet of glacial sediment. Today those sediments underlie the flat floor of Yosemite Valley. Today in the higher portions of Yosemite National Park, small-scale evidence of Ice Age glaciers can still be seen. Grooves and scratches in the Valley's bedrock, known as "striations," are evidence that glaciers scoured and gouged their way through the valley. And, rocks different from the Yosemite bedrock can be found. These out-of-place rocks, known as "erratics," were transported by glacial ice from areas outside the park, but they are now left as evidence that a glacier passed through. Today, at the highest elevations in the Park (over 12,000 feet above sea level), two glaciers, Lyell Glacier and Maclure Glacier, are still active. These glaciers are small and slowly retreating as climate change warms their environment. They are expected to last just a few more decades. Very few visitors see Lyell and Maclure Glaciers because long strenuous hikes are required to reach their high elevations. Crevasses, boulder fields and slippery ice make them dangerous places to visit. However, you can visit these glaciers easily today by viewing the video at the top of this page.